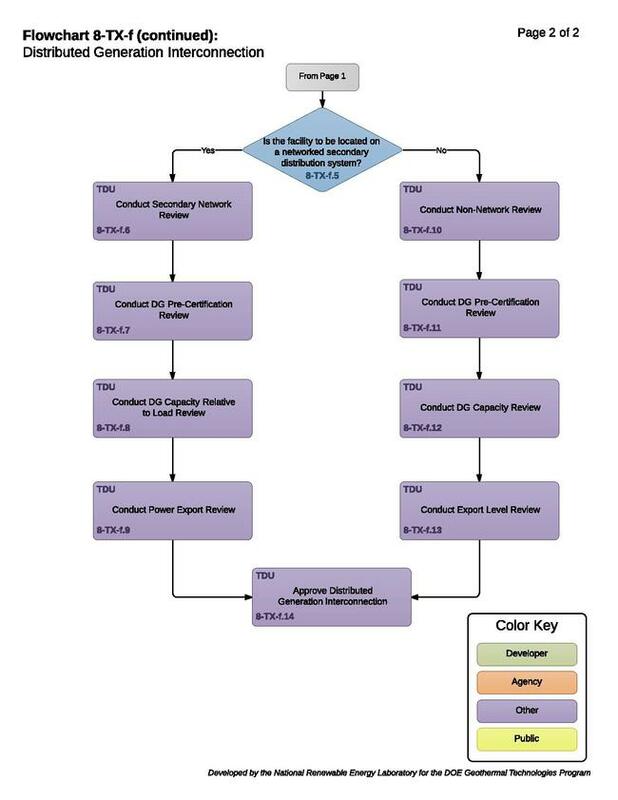 This flowchart illustrates the process for distributed generation (DG) interconnection in the state of Texas. The DG interconnection rules, developed by the Public Utility Commission of Texas, set forth the rights and responsibilities of both the DG developer and the transmission distribution utility (TDU). Developer will furnish and install a manual disconnect device that has a visual break that is appropriate to the voltage level, and is accessible to the utility personnel, and capable of being locked in the open position. Developer must follow the utility’s switching, clearance, tagging, and locking procedures, which the utility must provide for the developer. 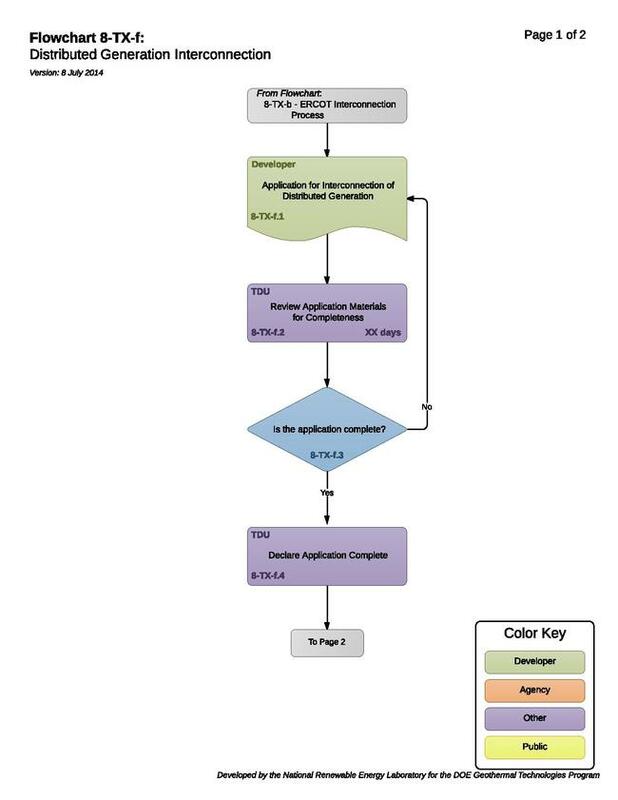 8-TX-f.3 – Is the Application Complete? Developers must provide all necessary information with their application. Failure to supply all necessary information is grounds for rejection of the application. The TDU will have its engineering staff evaluate completed applications to determine whether pre-interconnection studies are required. 8-TX-f.5 – Is the Facility to be Located on a Networked Secondary Distribution System? Developers and the TDU must use best reasonable efforts to complete the interconnection process in instances where developers request interconnection to a secondary network system. Certain aspects of secondary network systems create technical problems that may make interconnection more costly to implement. The TDU may reject applications for a distributed generation facility under this section if the TDU can demonstrate specific reliability or safety reasons why the distributed generation should not be interconnected at the requested site. However, the TDU must work with developers to resolve such problems to their mutual satisfaction. The TDU must make all reasonable efforts to seek methods to safely and reliably interconnect distributed generation facilities that will export power. This may include switching service to a radial feed if practical and if acceptable to the customer. If the DG qualifies as pre-certified under Texas’ pre-certification requirements, the review can proceed to the DG Capacity Review. If the DG does not qualify as pre-certified, the TDU is allowed up to six weeks to perform a study that may involve a fee. Secondary networks are used where load is sufficiently dense to justify the added reliability and added cost of such a system. DG facilities that use inverter-based protective functions with total distributed generation (including the new facility) on the affected secondary network representing no more than 25% of the total load of that network. Other on-site generation facilities whose total generation is less than the local customer’s load (non-export) and with total distributed generation (including the new facility) on affected secondary network representing no more than 25% of the total load of that network. The TDU will compare the total network load to the total DG capacity in order to determine whether installation of the DG will require costly changes to the utility system. If the DG installation will not result in costly changes, then a study fee will not be charged because it is assumed that no study is necessary. It is assumed that all inverter-bad DG under 20kW is so small that, irrespective of the 25% threshold, no study is necessary and therefore the application must be accepted and no study fee may be charged. The TDU must determine whether the DG will export power in order to ensure that the DG complies with PUCT Substantive Rule 25.211(h)(2). All export systems on network secondaries may be subject to a study for which a fee may be charged. Any DG system designed for non-export will not adversely impact the secondary network protection schemes and, for systems with explicit non-export capabilities, the need for additional protections is eliminated. Non-inverter-based DG that does not export and meets the 25% threshold should not require changes to the utility system in order to accommodate the installation. The TDU must accept these applications, and a study fee may not be charged since it is assumed that no study is necessary. If the DG is not inverter-based and is not less than minimum applicant load, but still complies with the 25% threshold, a study fee may be charged to the applicant to determine whether any modifications need to be made. The study can take up to four weeks. If the total DG capacity on a particular network exceeds 25% of the total load of the network, the TDU may halt the application process up to six weeks while performing a study that may involve a study fee. Once the study is complete, the application processing and the allowable processing time will continue. Any DG project that is not in a network secondary distribution must go through a Non-Network review. If the DG qualifies as pre-certified, the non-network review can proceed to the DG Capacity Review. If the DG equipment is not pre-certified, a study may be performed that can take up to six weeks and involve a study fee. If the DG capacity is less than or equal to 500kW, the review can continue to the export level review. If the DG capacity exceeds the 500kW threshold, the TDU is allowed up to four weeks to perform a study that may involve a fee. If the DG system falls within a specified export limit, it is assumed by the TDU that the application of the DG on that portion of the distribution system will not cause complications. DG which exceeds the threshold may be studied to determine whether it could cause islanding or adverse power flows. The TDU is obligated to connect DG facilities that comply with the procedures described in the PUCT DG Interconnection Manual and the technical requirements of PUCT Substantive Rule 25.212. A TDU does not have the right to unilaterally refuse to connect a DG project. The TDU is required to document the technical or business reasons for not granting a DG application as filed, and is obligated to work with the developer to resolve any problems to the satisfaction of both parties. If the TDU believes that although a specific DG application meets the PUCT's technical requirements for system safety and reliability, but the costs of reconfiguring the TDU system to accomodate the new DG unit appear excessive, the TDU may seek guidance from the PUCT before approving or denying the DG application.